An Altea area map covering the region and most important towns around the Costa Blanca. 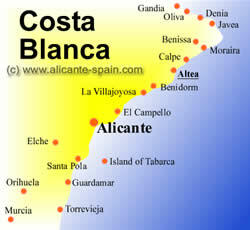 Altea is located directly at the coast right in between Benidorm and Calpe. Please scroll a bit down to find an interactive map of Altea , which allows you to zoom in and out. This way you will get a detailed Altea streetmap. Find out how far Altea is located from major cities around the Costa Blanca region and Spain. Find additional travel information about the city of Altea here and enjoy the Sightseeing Impressions of Altea video.